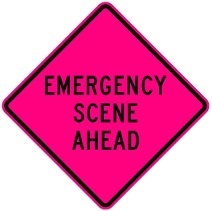 Emergency Scene Ahead on reflective Fluorescent Pink Roll-up with heavy-duty fiberglass rib supports and anti-kiting Velcro strap. Emergency Responder Safety Institute recommends this message for any incident expected to last more than 30 minutes. ERSI says it's "unnecessary to have multiple early warning signs on fire apparatus, ambulances, and police cars or tow trucks. A single compliant sign is adequate for early traffic control at any type of emergency scene."